Why Do You Need a Retail POS System? So, What&rsquo;s the Point (of Sale)? Having great salespeople can be crucial if you’re running a retail business, but it’s not just your staff that makes the difference in the front of the house. Having the right equipment at the counter can greatly improve the efficiency of your retail business and this is especially true in the case of a digital point of sale (POS) system. A POS is to the cash register what a smartphone is to the old rotary phone you might be old enough to remember. The old one got the job done, but had nowhere near the speed, features, and ease of use of its contemporary replacement. A top POS system can also give you access to all types of data that can really be a boon to your business, helping you keep track of sales, inventory, customer information and purchase history, and much more. ShopKeep is an easy-to-set-up and operate POS system that is tailor-made for small and medium-sized retail businesses and food service operations. The POS has its own “ShopKeep Pocket” mobile app which allows you to stay on top of things no matter where your work (or non-work life) takes you, even if you go offline temporarily. Along the way, you can make use of all types of important workforce management functions, including payroll and time management, inventory management, and customer marketing (including email integration with MailChimp and gift card/loyalty programs). When it comes to customer support, ShopKeep representatives are available to provide assistance 24/7/365, including by phone, live chat, email, text, and through an online form. Revel is one of the biggest names in the POS industry and can work with businesses large and small, no matter their aspirations. Revel has a wide range of options for retail business, especially in regards to data that you can use. The company’s “insights” feature provides you with real-time data management tools that can keep tabs on everything from your overhead to sales to inventory and labor costs. When it comes to customer relations management, Revel can provide you with all types of data about which customers liked what items, enabling you to reach out and build your word-of-mouth. In addition, Revel is very adept at integrating with your social media accounts, which can go a long ways toward increasing the recognition of your business. All types of companies can benefit from putting Lightspeed to work for them, but the company has definitely put a special emphasis on the retail world. First off you’ll enjoy access to unlimited 24/7 customer support, as well as a free one-on-one onboarding session to make sure that you and your staff will be able to operate the system without any major hangups. Once you’ve got Lightspeed running in-house, you can use its comprehensive employee management to stay on top of your workforce, and the customer relations management system in order to improve your follow-up with customers. And in what is definitely a boon for just about any business, the platform integrates with a number of programs that businesses love to run, including MailChimp and Quickbooks, to name just two. This is in addition to the extensive analytics compiled by the company, which can provide you with great insight on your business. The company allows you to order a wide range of hardware, if need be, and provides an extensive online knowledge base. Best POS System is a Clover reseller. Clover is a highly-versatile POS system that is quite easy to set up—and learn—and which can provide you with all types of hardware for running your business. The system is entirely cloud-based so you access it anywhere, no matter where your work takes you. Instantly accept payment in all forms on your desktop console or on a mobile device. The simple, intuitive interface allows you to seamlessly make and alter orders and manage bills. You can also run customer rewards programs with your repeat customers, and for your staff, making scheduling easier than ever. Best POS System runs an app marketplace where you can get all types of add-ons for your POS. This allows you to access hundreds of apps to create a bespoke POS for your business, though some competitors may come with some of these features standard. You may have seen somebody out there using Square and been struck by the simple, sleek design. Square uses its “key,” a simple plug-in card swipe that you plug into the headphone jack of a mobile device. You don’t need any extra hardware, you just plug it in and start swiping. The company has also won fans for its lack of monthly charges and it's easy pricing structure. What type of features do you get with Square? You get an easy to use dashboard that you can use to access extensive “Square analytics” on your sales, refunds, inventory, employees and more. The system will also organize and handle invoicing for you and help you carry out extensive customer loyalty and marketing campaigns. In addition, Square will provide you with 24/7 customer support and extensive safeguards to keep your business secure. It can be hard enough to keep up with even the most basic aspects of running a retail shop, much less trying to remember exactly which type of shoes one particular client prefers and how many pairs of socks they bought over the past 2 or 3 years. A digital POS system can help you keep track of not only your overall sales but also the exact purchases made by individual customers, and can catalogue this data in a way that can make your business smarter and more efficient. In a wider sense your sales data can show you what times of day are best for your business, which items sell best and at which price, and which items just aren’t worth the shelf space. These details can help you plan not only how to sell your stock, but also how to arrange your workforce so that you have them where you need them—when you need them. A POS system can easily keep track of how much inventory you have in house and how particular items are selling. This can give you detailed (down to the slightest minutiae) reports of which items you should stock more (or less) of, so you can meet customer demand and also stay ahead of your suppliers and vendors. POS systems help empower employees by giving them extensive information at their fingertips, helping boost their ability to service—and upsell—customers in real time. On the storeroom floor, this means employees can be more agile and able to answer customer demands in real time without having to consult a supervisor. For instance, at a clothing store, an employee holding a POS tablet can approach a customer and instantly check if the item they’re looking for is available in their size, saving them a trip to the stockroom. If the business is part of a chain that is hooked up to a centralized retail POS system, they can instantly search all other branches in the general area to find a store where the customer can find the item in their size, increasing chances of making that potential sale. Put it this way, if knowing is half the battle, then the data that POS systems give you in real time about sales and inventory, can get you about halfway to victory. Signing up for a POS doesn’t need to mean that you’re simply replacing your old register with another desktop machine that will be more or less the same size but sleeker. 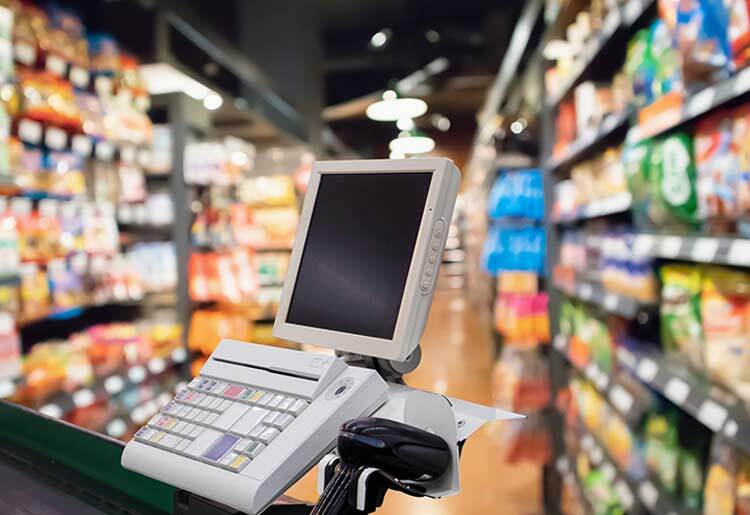 In addition to desktop registers, most POS companies these days can be operated on easy-to-use, handheld devices like tablets and smartphones. Not only does this mean that you no longer need a central check-out counter, but you can also take your mobile register with you wherever you do business, and never miss a beat. So, What’s the Point (of Sale)? A digital point of sale set-up for your retail company can mean a lot of things. It can mean help planning out your employees’ schedules, it can be a digital worker bee that keeps watch on your inventory and never takes a break, it can be a register for carrying out instant transactions in store or far beyond, and it can be a great vessel for expanding your customer outreach. However you use your POS system, it can give you that extra boost and set of tools to make running your business easier—and hopefully—more lucrative than ever before. See our in-depth reviews of the top POS systems for more information.